At today’s pr ayer vigil for peace with Pope Francis at the Vatican, the service began with two invocations – first, through words and song, invoking the Holy Spirit’s presence in the words of the Veni Creator Spiritus, and second, through the procession of an ancient icon of Mary through St. Peter’s Square to be enthroned during the service. This is a big deal. 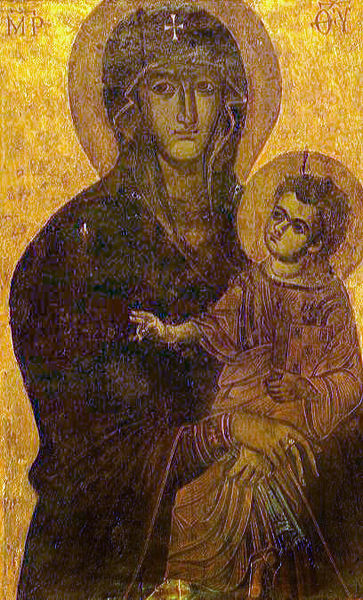 While appropriate, given the coincidence of today’s vigil with the feast of the Nativity of Mary tomorrow and Francis’s explicit invocation of Mary, Queen of Peace, in his earlier messages, the use of this particular icon bumps up the symbolic value of Francis’s call for peace in a way difficult to understand without some further knowledge. While pretty obviously “restored” through the centuries, with varying degrees of success, the original image is very ancient, perhaps as ancient as the 7th or 8th century. Its title, Salus Populi Romani, the “Health/Salvation/Proctectress of the Roman People,” gives some sense of the importance of this image to the Christian Church in Rome. Normally housed at the Basilica of Santa Maria Maggiore, the procession of the icon outside of the basilica has always marked times of great trial or great celebration in the history of the city. Examples of the former include the cholera epidemic in Rome in 1837 and the eve of the Battle of Lepanto in 1571; of the latter, the Marian year of 1953, which is, as far as I know (and I’m not an expert, here, so please correct me in the comments if you have better knowledge), was the last time the icon was used in procession outside Santa Maria Maggiore, with the exception of some use just outside of Santa Maria Maggiore. Francis went to pray at this image shortly after his election as bishop of Rome earlier this year. More interesting, perhaps, is what Francis has done by invoking Mary’s protection for the people of Syria, and for victims of violence throughout the world. He has symbolically named Mary not only as the Salus Populi Romani, but also as the Salus Populi Syriani, and invited Romans, Syrians, and us, throughout the world, to pray for peace with Mary as a guide. The fact that this icon was once processed around the city of Rome to pray for a military victory against Muslims (at Lepanto) is now being invoked for the protection of Syrians against the attack of a supposedly Christian nation demonstrates how much things have changed since 1571.